A memorandum of understanding (MOU) is an agreement between two or more parties that specifies the terms and details of an understanding, including each parties' requirements and responsibilities. An MOU is typically used as a precursor to a formal definitive agreement, which specifies legally binding terms between the parties. A Memorandum of Understanding (MOU) is a short written statement outlining the agreement between two or more parties who agree to do or not to do certain things moving forward into the future. In the Collins English Dictionary, the document is an agreement between the parties that isn't a legally binding contract. So, while an MOU isn't legally enforceable, it is a written record that often acts as the first step in creating a formal contract. A Memorandum of Understanding is sometimes also known as a “letter of intent.” However, this isn’t entirely correct. See our “MOU vs Letter of Intent” to learn more. Both an MOU and a letter of intent can be used for diplomatic communication between the parties since it serves to ensure that those involved are on the same proverbial page. Create a free Memorandum of Understanding in minutes with our professional document builder. Memorandums of Understanding are somewhat complicated documents that occupy the space between informal agreements and legally-binding contracts. In this guide, we detail the differences between MOUs and other business agreements, how to write one, and when to use one. With the information provided, you'll be better prepared to utilize MOUs. 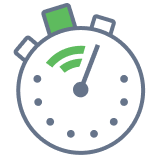 Creating a payment schedule: especially if the contract does not specify one. Explaining intentions: organizations may use an MOU to detail their intentions and purpose related to a contract. Outlining conditions of transactions: companies may use MOUs to serve as an addendum to a legal contract--e.g. prenuptial agreement or a scale of property. Another form of MOUs used in business and for personal reasons include an information memorandum. This document explains the information that the parties have related to whatever situation or project they're involved in. It may also be called a memorandus. Governments may also use MOUs. For example, during the 2004 United States presidential campaign, John Kerry and George W. Bush agreed to a 32 page MOU that created guidelines for their televised presidential debates. In 1972, President Richard Nixon signed an MOU with the Soviet Union that established a telecommunication link between the two countries in order to prevent nuclear war. MOUs are popular among certain industries and less so among others. Lawyers, for example, generally do not like MOUs because of their legal ambiguity. Government bureaucrats, on the other hand, like MOUs because they are informal and allow them to avoid the red tape and extended timelines associated with formal contracts. An MOU is not a contract. It is technical something that would qualify as informal written communication. It's more formal than a verbal agreement, but they're not legally binding like a contract. The key difference between an MOU and a contract is how enforceable it is. An MOU, in other words, articulates an agreement that isn't legally binding. It serves as an outline of expectations. A contract, on the other hand, establishes a series of legally binding obligations. If the obligations in the contract aren't met, the party that was injured by the unfulfilled contract generally have the right to sue. These documents are very similar. In fact, MOUs are sometimes referred to as letters of intent. Like a letter of intent, an MOU outlines an agreement between parties and is usually created in advance of a formal contract. The primary difference between an MOU and a letter of intent is that a letter of intent is never legally binding. Technically, an MOU can be legally binding if one party relied and acted upon the agreement and lost money or was otherwise injured because the other party did not meet their agreed upon obligations. What are the Components of an MOU? Date of agreement: located at the top of the contract, the date of agreement indicates the month, day, and year in which the agreement is made and takes effect. Introduction: the introduction should provide an overview of the agreement, identify the purpose of the document, parties involved, and why the involved parties are entering into the agreement. The introduction should also offer details about each party involved. Purpose of MOU: this is reason the MOU is being created. It should detail how the parties involved will use the increased capacity provided by the MOU. To get a better understanding, run an Internet search for a sample MOU. Read the example sentences so that you may draft your own purpose statement. Scope: lists agencies and jurisdictions included in the agreement and their relationship to the parties involved. This includes end users, the level of command/government, etc. For example, are there government agencies that will use the resources included in the MOU? Cooperation: the activities performed and which partners will perform them. Resources: the funds and other resources that each partner brings to the agreement. Disclaimer: a general statement indicating that all activities that take place under the MOU must be in compliance with both state and federal law. Conditions of alteration or termination: this section clarifies the conditions and terms under which the MOU can be terminated, altered, or amended. Signatures: each party then signs the MOU. If one or more of the parties involved are companies, the CEO, departmental chair, director, or other involved executive of the companies must sign on behalf of the corporation. How Do You Write a Memorandum of Understanding? Planning phase: each party involved determines their wants and what they're willing to negotiate on. Drafting phase: parties then draft the initial MOU. Negotiating phase: the MOU typically outlines guidelines that govern the mediation process. Timeline negotiation: Once negotiations are completed, parties establish a timeline for the MOU to take effect, when it expires, and any rules regarding termination. Restrictions: finally, each party adds any restrictions, disclaimers, privacy statements, etc., and sign the final MOU. When are MOU's legally binding? Identification: all parties involved are listed by their legal name, address, and business (if applicable). The MOU must also identify itself as an MOU, not a contract. Intention: the MOU must clearly identify the purpose of the agreement. Furthermore, there should be separate sections for the intentions and goals of each party. Consideration: this section should detail financial obligations--who will keep track of finances, what methods must they use, etc.? Acceptance: All involved parties must sign the MOU. With each of these sections in place, if the language of the MOU clearly outlines the terms of the agreement and is backed by consideration, the MOU may be treated like a contract and may be legally binding. "This memorandum is in no way a legally enforceable contract between the aforementioned parties." If, however, you want a legally binding MOU, be sure to use clear, specific language. The best way to create an MOU that is also cost efficient is to use a template. The aforementioned will not, unless so authorized or required by the duties mentioned within, reveal or divulge to any person or entity any information concerning the affairs of Business, Ltd., or the affairs of any of Business, Ltd.’s subsidiaries. This restriction is unlimited and will only cease to apply to information that becomes public domain. Only clear, specific language will make the terms of your MOU stand up in court. So, if you’re creating an agreement in which you want a legal edge without incurring any edges against your own interests, gear the terms in such a way that they absolve you of potential blame, and try to insert whatever binding clauses you deem necessary. A great way to monitor the potency of your MOU is to use a legally verified template, either by filling out a free memorandum of understanding template or creating your MOU based on a sample memorandum of understanding. Both of these tools can be found on the internet, though we recommend you do some background research and be sure you are using a reputable site. Remember: MOUs do not always involve the exchange of money. Any MOU that does involve the exchange of money is almost always considered a legally binding contract. MOUs occupy a somewhat nebulous legal space in the business world. Yet, they are also important documents for any individual or business. We hope this guide clarifies the legal standing of MOUs, their proper uses, how they differ from legal contracts, and how to use one. A memorandum of understanding is a precursor to a contract. A memorandum of understanding explains what both parties want out of a contract and ensures that everyone is on the same page. The objective of a personal financial statement is to present a summary of the person's financial wellbeing. A personal financial statement should include information about all of your assets and your liabilities in order for it to be accurate. Non-disclosure agreements are legally binding in most states. Non-disclosure agreements are signed by employees or contractors. When they sign it, they are promising that they will not disclose certain information about the company after they leave the company. 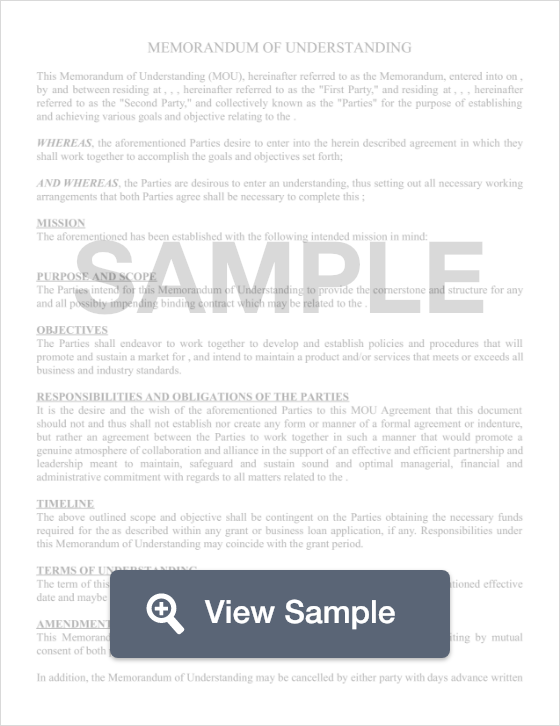 A letter of agreement outlines the basics of a contract between at two parties. A letter of agreement should list the goods or services that will be provided, when they should be provided, the price, and when payment is due. If both parties sign the letter of agreement, it is considered a legal contract.